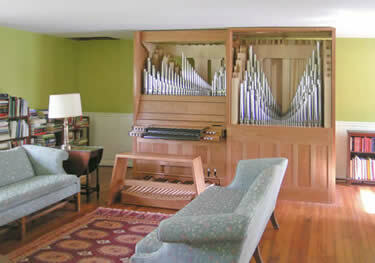 In summer 2009 Wahl Organbuilders installed this organ for a residence in Indianapolis. The footprint of our client's music room is twenty-five feet square, large enough to house the organ and a concert grand piano. But the ceiling height in our client's home is limited to eight feet, and our organs are built with open 8-foot tone to provide foundation and warmth. As pipe organs are most easily designed when copious height is available this limitation represented a meaningful design challenge. Our 2-stop practice instruments are designed with the same eight-foot height limitation in mind as this restriction applies to most contemporary houses, apartments, and practice rooms. Using our experience with the design of small instruments we proposed building the organ as if we were building two of our standard practice organ caseworks side by side, abandoning the usual tendency for organs to be symmetrical and vertical. This allowed room for all the pipes in a logical, accessible, and uncrowded manner. The first manual is housed in the right side of the casework along with the wind system while the key action runs horizontally for the full width of the instrument. The second manual and pedal divisions are housed in the left casework along with the keydesk and couplers. The full-length 16- and 8-foot wood bass pipes are hung from the back of the cherry hardwood casework. The result is a deceptively simple design where all ten stops and the entire mechanism fit in a casework that is less than three feet deep. Please contact us to discuss a fully-considered design solution for your needs.